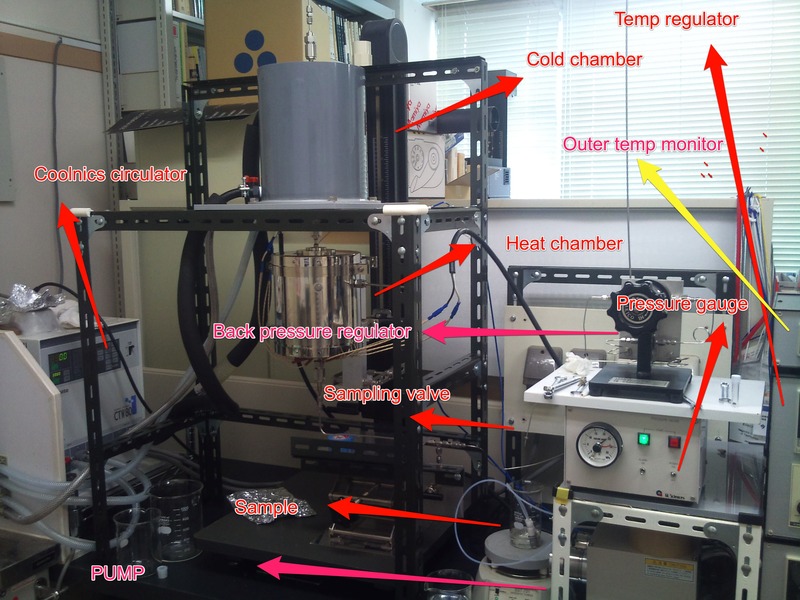 flow-reactor (HCFR) build by Ei-ichi Imai at Nagaoka Institute of Technology. 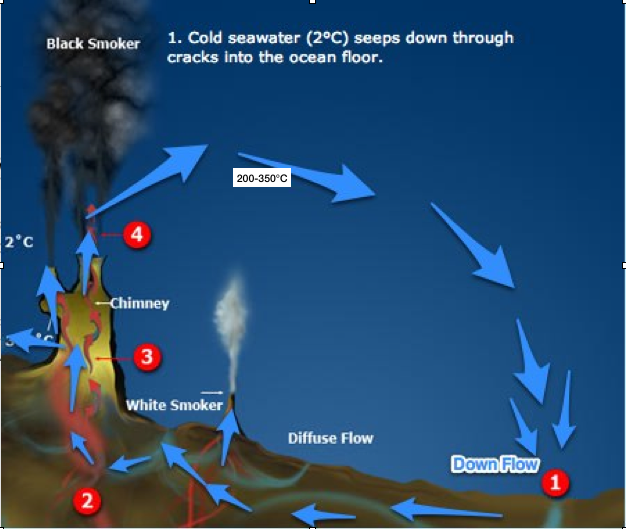 In the previous post, i wrote about a conventional kind of submarine hydrothermal simulator (SHS) called the autoclave. In today’s post i will talk about the flow kind of reactor which is more realistic compared to the autoclave. Jack Corliss, the man who discovered a real SHS, came up with the notion that a flow-type reactor is essential for new origin of life experiments, as he argued that the quenching effect of the cold seawater is important to hold the short-lived intermediates (hydrogen cyanide, sugars and etc) or as he calls it “quasi-species” in prebiotic synthesis of bio-molecules. This essentially means that a flow kind of simulators are required to better represent a real SHS to produce more reliable results than the autoclave. 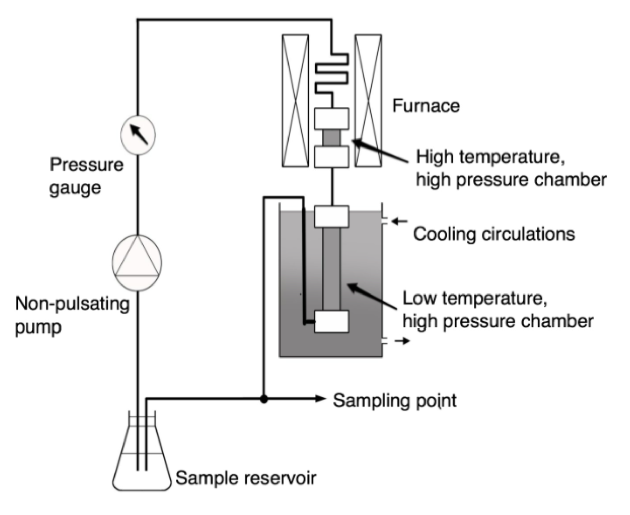 Co-incidentally, Koichiro Matsuno, designed a principle idea of a flow reactor which could reflow the fluids repeatedly in heat and cold (i will name here-forth as hydrothermal circulation flow-reactor (HCFR) for convenience). 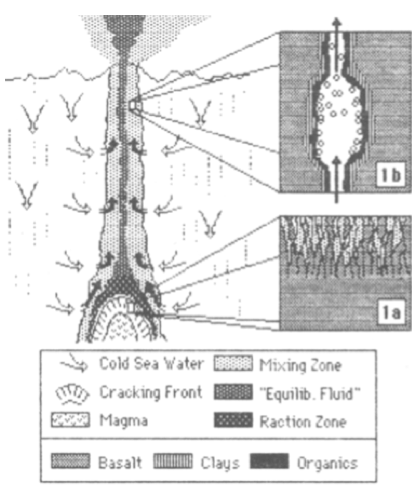 Ei-Ichi Imai, Koichiro Matsuno and co-workers went on to build (image above, schematics diagram below) the reactor and experimented using many bio-molecules. diketopiperaxine, gly-ala, ala-gly, gly-ala-ala, ala-ala, ala-ala-ala and ala-ala-ala- ala was created when the solution was heated with similar conditions. What i described abover is a big thing in origin of life studies. This land-mark discovery, was the first to show that oligomerization (a shorter version of polymerization) could occur using basic amino acid (gly), without the help of DNA and RNA molecules which are crucial in making proteins in life. In their other works, oligomerization of nucleotide up to trimers (basic monomer of DNA) was also observed when 20mM of adenosine monophosphate was used with 1mM ZnCl2 were reflowed at 110°C. Despite the findings made by HCFR, the system is rather hypothetical, since we know that real live vents don’t really circulate in that manner (shown below) however, this kind of reactor is useful when it comes to monitor chemical changes in the system. In my next post, i will review another kind of flow-reactor in Japan which i have also worked on in the past. HCFR mimicking a hypothetical circulatory system in a real life vent.